From my unique vantage point, the performing arts scene in Central Indiana is as varied as it is comprehensive. Evidence of that perspective is the diversity and scope of the productions I saw this past week. They included a preview of the Indianapolis Opera’s “La Bohème,” a preview of “Building the Wall,” the inaugural production of Fonseca Theatre Company, and “The Lion King,” a presentation of Broadway in Indianapolis. Herein are my reviews. 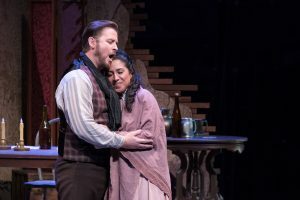 The preview of Indianapolis Opera’s “La Bohème” that I attended Wednesday, Sept. 12 at the at The Tarkington at The Center for the Performing Arts in Carmel was seen with a great deal of anticipation because early in the week, I had interviewed soprano Cristina Bakhoum Sanchez, who sang the role of Mimì. Prior to that, I had seen a performance of the opera’s Act 3 by the cast at the 100th Birthday Celebration for opera patron and philanthropist P.E. MacAllister held Sept. 5 at Garfield Park Amphitheater. Even though it was a dress rehearsal and there were some stops and starts to address tech and orchestra issues, I felt I saw a good representation of what the final product would eventually be and came away very impressed with its quality. For those unfamiliar with the opera, of which I have seen numerous productions, “La Bohème” is set in the Latin Quarter of mid-19th century Paris. The opera focuses on a group of young artists during the height of the Bohèmian movement. Portraying the relationships and daily struggles of Rodolfo, the idealistic young poet, Mimì, the young seamstress, and their friends, Puccini’s opera displays the romantic idealism and tragic circumstances that shaped their unconventional lifestyle. Bakoum Sanchez was splendid in the role of Mimì, not just from the standpoint of her powerful vocal performance, but also her heartbreaking portrayal of tragic Mimì, which moved me deeply. Bakhoum Sanchez’s formidable talent and stage presence are of such high caliber that her future in opera portends great success. Tenor Gregory Turay, who was memorable last season in IO’s “La Traviata,” also excelled this time around in his combined vocal and dramatic performance as writer Rodolfo. The romantic interaction between Bakoum Sanchez and him was completely believable. Their performances in the death scene were so touching that I was nearly brought to tears. The chemistry between baritone Daniel Narducci as the painter Marcello and soprano Donata Cucinotta as singer Musetta, his fiery on-and-off girlfriend, was also very convincing, with both artists turning in exceptionally strong vocal and acting performances and each exhibiting a flair for comedy as well. The orchestra under the baton of Craig Kier did fine justice to Puccini’s score. As far as the production’s stage direction, Benjamin Smith was masterful, especially in the manner in which he blocked Act 2, which takes place in the Latin Quarter. In a setting that required a large cast of chorus members, including children portraying an array of characters, Smith did a superb job choreographing all the activity surrounding the main characters at Cafe Momus. Because of its superb technical capabilities, the Tarkington opens up a lot of possibilities for technical creativity. Consequently, the lighting for the production was right on point, as was the production’s sets, which fit the story perfectly, as well as the well-designed costumes which accurately fit the period. Such was the overall high quality of the production that, like many others in our community, I felt gratified that our city has an opera company that we can all take pride in. As Indianapolis Opera continues to move in a positive direction, my hope is that we can all look forward to more work of the same high caliber and that it be supported in return. For tickets and information about Indianapolis Opera’s 2018-2019 season call (317) 283-3531 or visit indyopera.org. Millicent Price & Clay Mabbitt – Courtesy of Fonseca Theatre Company. Used with permission. My only regret in seeing a Thursday preview of Pulitzer Prize, Tony Award-winner Robert Schenkkan’s play, “Building the Wall,” the inaugural production of Fonseca Theatre Company at Indy Convergence on Indy’s near West Side, was that I was not available to attend opening night on the following Friday. From all accounts, there was a sold-out house and a joyous celebration that followed the show. Nevertheless, the fact that the performance I saw was the very first in front of an audience was still a momentous occasion. As most anybody who follows the local arts scene knows by now, Fonseca Theatre Company was recently founded by Bryan Fonseca, the former producing director of Phoenix Theatre, which he founded 36 years ago and left this past May. Indy Convergence is the temporary home for FTC until renovations of its new space nearby on West Michigan Street in the River West neighborhood are completed in January of 2019. The theatre exists to “give voice to and celebrate Indy’s minority communities” and is located in a diverse neighborhood, both of which are compelling factors, but it’s also absolutely remarkable that Fonseca fast tracked its inception in such a short time. So, to be present for the first performance of the new company, of which I am a member and acutely conscious of the controversy that preceded its founding, its historic implications did not escape me. Talk about fast tracking. Schenkkan wrote the timely, ripped-from-the-headlines “Building the Wall” on the eve of the 2016 presidential election that saw Donald Trump defeat Hillary Clinton in a surprise upset that many still can’t get past. A dystopian drama set in the future, the riveting play imagines how Trump’s anti-immigration rhetoric turned into federal policy. Government directives have resulted in the mass round up of millions of undocumented individual with so much overflow, they are housed in private prisons and internment camps. The former warden is awaiting sentencing for something terrible that happened when he was in charge. During a contentious, sparring interview with an African-American historian who has come to seek the truth, he eventually reveals how the unimaginable could become reality and how history could horrifyingly repeat itself in a most heinous, evil way. Directed by Fonseca, the FTC production features a solid acting duo. Playing the role of Gloria, the cool, shrewd, unflinching archivist, who is informed by her own experience with prejudice, is veteran Phoenix and Indiana Repertory Theatre actor and Fonseca Theatre Company member Millicent Wright. Wright, as usual, inhabited her role and turned in a controlled performance that was both multi-dimensional and nuanced. At a time when many Americans fear our country has been severely diminished and worry about the very collapse of our revered institutions, morality and even the Constitution, “Building the Wall” is a cautionary tale that reinforces that we not bury our heads in the sand, educate ourselves about issues that affect us, and maintain constant vigilance as citizens. 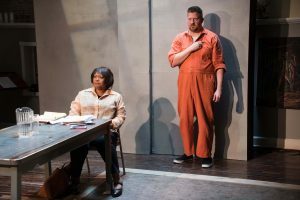 As the first example of what theatre-going audiences can expect as Fonseca Theatre Company continues to pursue its critical mission to give voice to the marginalized, this production mightily succeeds and deserves an audience. For tickets and information about “Building the Wall” at Fonseca Theatre Company, go to fonsecatheatre.org. Full disclosure: Until I saw Disney’s “The Lion King” Friday on media night at Old National Centre, I had not seen it previously. It wasn’t for any other reason than the opportunity never presented itself. For those like me who want to see what all the fuss is about or even those who’ve seen the 20-year-old Broadway musical multiple times, now is your chance to experience one of the most popular shows in musical theatre. It runs until September 29. As a reviewer, it’s a good thing that I had not seen it because I was able to experience this particular national touring production presented by Broadway in Indianapolis with fresh eyes. 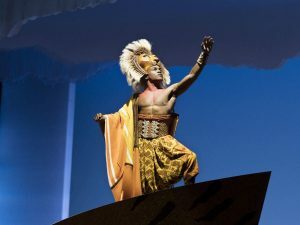 Of course, I had a particular interest in seeing it because a few weeks ago, I had the pleasure of doing a phone interview with Jared Dixon, the young actor who plays Simba. During that interview, Dixon piqued my interest because of his personal insights into the show and experiences touring with the show around the country. As far as Dixon’s performance, I can categorically report that the actor-singer-dancer was marvelous. He was ideally cast as the young heir to the throne left empty when his father was murdered by the villainous Scar, also splendidly played by Mark Campbell. Interestingly enough, I happened to meet Campbell in the WISH-TV 8 Indy Style green room when we were both guests on Thursday’s show. A stand-out performance was that of South African actor Mukelisiwe Goba, who plays Rafiki, the show’s narrator and oracle. Demonstrating a rare vocal power in “Circle of Life,” her powerful presence and authenticity made quite an impression on me. Also commanding was Hawaiin-born Samoan Gerald Ramsey, who played Mufasa. His towering performance of “They Live in You” was unforgettable for its potent vocal delivery. The performances of those in the large ensemble, with all playing multiple animal characters, were a complete marvel. With all participating in the non-stop action, executing Garth Fagan’s entrancing choreography, while wearing Julie Taymor’s astonishing costumes—the entire effect was complete over-stimulation, but in the best way possible. All of that, coupled with the lavish lighting and sets, masks and puppet design, orchestra and percussionists, and Elton John & Tim Rice’s incomparable score, made for a eye-popping spectacle. I am still savoring the show, with its positive message of good overcoming evil, for all of its utter splendor and beauty. If ever there were a true piece of art in musical theatre, it would be “The Lion King.” As a johnny-come-lately to its allure, I implore you to not miss it. It was one of the most magical, uplifting experiences of my entire theater-going life.